Corporate financial accounting and taxation are complex subjects. For this reason, many people tune out when issues that involve corporate tax practices rise to the level of public debate. Unfortunately, many legislators shy away from these issues for similar reasons. But while corporate taxation can be mind-bogglingly complex, nontax experts can learn enough to join the debate. Recently, the debate has focused on the increasing number of corporate inversions. A corporate inversion occurs when a U.S. multinational company renounces its U.S. citizenship by combining with a smaller company in a foreign country where, typically, the corporate tax rate is lower and other tax rules are favorable. A multinational company is a company that is registered and has operations in more than one nation but that identifies one of them as its home. The foreign company becomes the legal parent company of the multinational operations, even though the U.S. company may continue to function as the parent for management purposes. In fact, the U.S. company’s operations, as well as the location of its employees, may not change at all. The United States taxes the worldwide earnings of its legal residents. After inversions, however, the nation can no longer impose taxes on most of the non-U.S. earnings of multinational corporations. So while some corporate inversions may be based on sound nontax business reasons, nearly all of them, through adept tax planning, enable U.S. multinational companies to avoid paying substantial amounts of U.S. tax—both on income they earned before the inversion and on income they will earn in the future. This drain on U.S. tax revenue, combined with the rising number of corporate inversions, is concerning policymakers. According to the Congressional Research Service, over the past 10 years, 47 U.S. corporations have changed their legal residence through corporate inversions. There have been 12 corporate inversions since 2011 alone, with at least 10 more waiting in the wings. Companies that do inversions say such action allows them to remain competitive. 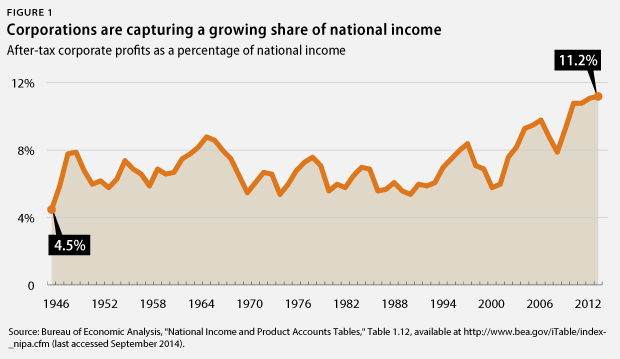 However, profits of U.S. companies are at an all-time high, and they are increasing. 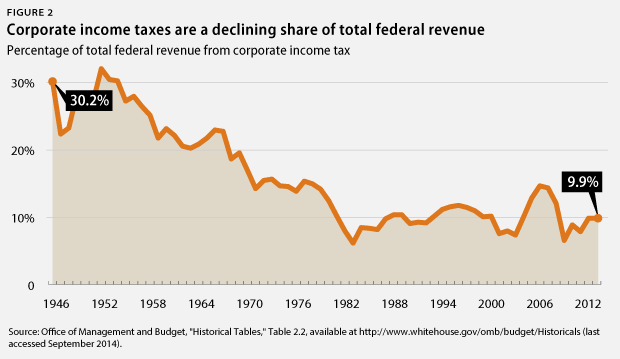 At the same time, corporate revenues are declining as a percentage of the total U.S. tax revenue collected, from about one-third of total revenues in the 1950s to about one-tenth today. While this is partly due to the more than $100 billion in corporate tax breaks found in the U.S. tax code, it is also because U.S. multinationals are highly skilled at using the tax code to avoid taxes on their foreign incomes. In fact, multinationals’ profitability is confirmed when their tax returns are viewed in conjunction with their general accounting books; investors and corporate executives use these books to measure firms’ performance. Ironically, at least one rating service has pointed out that inversions can actually harm corporations’ credit ratings, due to the large amounts of debt the corporations acquire to fund inversion deals, as well as the practice of using funds in deferred earnings accounts to buy back company shares and make dividend payments. Corporations should instead focus on longer-term strategies and risks. Many corporations say that the U.S. corporate tax rate is too high and that inversions allow them to take advantage of lower tax rates in other countries. But U.S. corporations actually pay taxes at an effective rate well below the 35 percent statutory corporate rate—as low as 13 percent to 17 percent for those that are profitable. In fact, one tax expert points out that U.S. multinationals are for this reason actually the envy of many foreign-based multinationals. However, many of the special breaks in the tax code are only available to certain industries or for certain assets. Therefore, some companies have low effective tax rates, while others pay closer to the statutory rate. Because multinational companies have tax avoidance options not available to strictly domestic companies, many domestic companies face a disadvantage when competing against them. While policymakers on both sides of the political aisle say that the U.S. statutory tax rate should be reduced, they also say that any rate reduction must be accompanied by the reduction or elimination of the special tax exceptions many companies enjoy. Stronger measures to prevent tax avoidance, including tax avoidance by U.S. multinational companies, are also needed. Inverting U.S. companies say that other countries only tax income earned within their own boundaries. In general, the United States taxes the worldwide income of its citizens, including corporations, while nearly all of its trading partners only tax income earned within their territories. But the U.S. tax system is not purely a worldwide system, and most territorial tax systems are not purely domestic. While it is true that the United States taxes the worldwide income of U.S.-based corporations, those same corporations are allowed to defer paying U.S. tax on profits earned overseas until they reinvest those profits back in the U.S. company. This deferral constitutes an enormous exception to the worldwide taxation principle, and U.S. multinationals hold a total of more than $1 trillion in their tax-deferred foreign earnings accounts. Moreover, when that income is reinvested in the U.S. company, the U.S. tax is reduced by any foreign tax already paid on it. Thus, there is no double taxation. At the same time, while virtually all of the United States’ major trading partners have so-called territorial tax systems, these systems have strong provisions to prevent domestic companies from shifting income on their books to foreign subsidiaries they control in order to avoid tax—especially foreign subsidiaries in very-low-tax havens. This is particularly easy to do with income from intangible assets, such as patents and digital-based products, which are highly mobile. For this reason, the United Kingdom is in the process of phasing in a 10 percent tax on the patent-related income of U.K. companies. This tax will even apply to income earned by a foreign company the U.K. company controls. These anti-base-erosion provisions make the corporate tax burden in some territorial countries higher than the U.S. corporate tax burden. Multinational companies have many tax avoidance tactics at their disposal even before an inversion. Once a multinational does an inversion, however, options for avoiding U.S. taxes increase significantly. These options overlap, but it is important to look at them separately in order to understand the extent of their tax benefits. As mentioned above, the United States taxes businesses’ worldwide incomes, but U.S. multinational companies are allowed to defer paying U.S. tax on their foreign earnings until they reinvest them in the U.S. company. However, deferred earnings not yet repatriated at the time of an inversion will likely never be subject to U.S. tax, so long as the multinational has astute tax advisors. Inversions are structured to accomplish this and, in fact, open up new options to use the untaxed deferred earnings without triggering U.S. tax. The savings that come from eliminating tax on deferred earnings may make a change in domicile worth it for some companies, since many U.S. multinationals hold billions of dollars in their deferred accounts. And the faster U.S. multinationals can shift income out of the country before an inversion, the better. This may explain the rapid increase in inversions: Companies are hoping to move before the government places further restrictions on inversions and their underlying tax breaks. The ability of U.S. multinationals to use corporate inversions to avoid U.S. tax on deferred earnings is particularly troublesome because it seems likely that some portion is earned through the benefit of U.S. companies’ operations and investments—and, by extension, the government’s legal system, research and transportation infrastructure, and educated workforce. Many of the tax code provisions designed to prevent U.S.-based companies from shifting profits to their foreign subsidiaries are not strong enough to combat aggressive tax planning by these companies. Furthermore, some 40 percent of U.S. companies’ pretax foreign profits are booked in five of the so-called tax haven countries, where it seems unlikely they could have generated such substantial profits. While it is difficult to prove how much of these profits come from the United States, it is important to tighten current tax rules around profit shifting and inversions. Normally, if deferred earnings are used to benefit a U.S. company—before or after an inversion—U.S. tax law deems this a distribution of dividends from the foreign company to the U.S. company, meaning that the U.S. company is taxed. Therefore, if the new foreign parent makes loans to the former U.S. parent or allows it to use the deferred earnings as assets to secure a loan, the Internal Revenue Service, or IRS, likely would deem these transactions distributions of the deferred earnings. Nevertheless, after the inversion, it may be possible to use the deferred earnings to benefit the U.S. company without triggering U.S. tax. This can be accomplished in a number of ways through a separate foreign company the U.S. company does not control. Through these highly complex transactions, deferred earnings may effectively be loaned to the former parent company. The former parent could also use them to buy back the shares the new foreign parent originally purchased to accomplish the inversion. Now a subsidiary of the foreign parent company, the U.S. company can obtain loans in the United States or elsewhere to finance the foreign operations of the multinational group. The interest payments are deductible against U.S. income. Before the inversion, the foreign profits generated by the U.S. company’s loans would have been booked as deferred. They potentially could have been taxed later, upon their reinvestment in the United States; but after the inversion, foreign profits from those investments are no longer subject to U.S. tax because the U.S. company is no longer the legal parent of the multinational group. Instead, the legal tax home of the multinational company is now located in another country, presumably one with a territorial tax system. The practice of leveraging U.S. corporations to finance foreign operations is called “earnings stripping” because it strips otherwise taxable income from the U.S. company, shifting it to foreign affiliates. The U.S. tax code places restrictions on U.S. companies when they incur too much debt to finance foreign operations, but the rules are not strong enough and do not address all the ways this type of tax avoidance can be achieved, especially after an inversion. The ability of U.S. multinationals to reduce their U.S. taxes through interest deductions contributes substantially to U.S. companies’ ability to lower their taxes, and the IRS has had mixed success challenging this practice in the courts. Because earnings stripping is more financially rewarding after an inversion, as explained above, it is a key driver of corporate inversions. The multinational company, now a legal resident of a foreign country and possibly controlling companies that are completely out of the United States’ reach, can now expand internationally without worrying that the United States will tax new profits from international operations—unless, of course, the profits are actually earned in the United States. With corporate inversions on the rise and many potential deals supposedly on the table, the pressure to address the loss of tax revenue is mounting. It is widely agreed that the best approach to the corporate inversion problem is to address it in legislation and, ideally, in the context of comprehensive tax reform. But many policymakers now believe the problem of revenue loss is too urgent to wait for major reform. According to Stephen Shay, former deputy assistant secretary for international tax affairs in the Department of the Treasury, failure to address corporate inversions now may make future tax reform more difficult, as the business community will be increasingly divided between those that have benefited from inversions and those that have not. Recognizing the urgency to prevent further loss of federal revenues, the Treasury Department recently acted to address the corporate inversion problem. In a July 28, 2014, article published in a leading tax journal, former Deputy Assistant Secretary Shay made the case for regulatory action by the Treasury Department to address corporate inversions. He indicated that regulatory action is particularly appropriate when a material portion of the U.S. corporate tax base is at risk, and he described several regulatory options available to the Treasury. Others have since agreed that regulatory approaches are appropriate. The Treasury guidance applies to corporate inversions that close on or after September 22, 2014. Significantly, the notice did not include any new restrictions on earnings stripping, but Treasury officials made it clear that more administrative action could be forthcoming. They also made it clear that, even with the guidance provided, legislation is still needed to solve the corporate inversion problem. This is due to limitations on the Treasury’s authority to act outside the scope of existing legislation. Members of Congress have proposed legislation to address corporate inversions. These proposals are contained in separate bills and in larger budget and tax reform measures. The goal of most of them is not to completely stop inversions but rather to discourage those undertaken mainly for tax avoidance purposes without independent economic rationales. The proposed legislation takes different approaches. The first would directly amend the current tax code provision on inversions, IRC Section 7874. These bills, S. 2360 and H.R. 4679, would require that the shareholders of the original U.S. parent company own less than 50 percent of the combined entity before the U.S. company could renounce its U.S. domicile. Section 7874 currently only requires that U.S. shareholders own less than 80 percent of the combined company, and it is likely that Treasury felt it did not have the authority to change this percentage. The U.S. company also would still be considered a U.S. citizen if the management and control of the new entity remained in the United States. Another legislative approach, S. 2786, would tighten current tax code provisions that companies use to shift income out of the United States and into foreign jurisdictions with low taxes. It would particularly tighten the provision that limits the use of debt by a U.S. multinational to finance foreign operations. Reducing the value of these provisions would reduce multinationals’ motivation to change their legal residence for tax purposes. Alternatively, S. 2704 would end federal contracts for companies that invert. A fourth approach, recently introduced as S. 2895 and H.R. 5549 by Sen. Sherrod Brown (D-OH) and Rep. Lloyd Doggett (D-TX), respectively, would require unrepatriated earnings to be included in income by any U.S. company seeking an inversion. S. 2895, introduced by Sen. Sherrod Brown (D-OH), would tax unrepatriated earnings when a corporation inverts. H.R. 5549, introduced by Rep. Lloyd Doggett (D-TX), would tax unrepatriated earnings when a corporation inverts. Rep. Dave Camp’s (R-MI) proposed Tax Reform Act of 2014 includes corporate tax changes to address earnings stripping. President Barack Obama’s revenue proposals submitted as part of his fiscal year 2015 budget includes both the general approach in the Levin bills and measures to restrict earnings stripping and transfer pricing tax avoidance. Many of the United States’ trading partners, including the United Kingdom, have lowered their statutory corporate tax rates dramatically in the past few years. In addition, all of these countries now tax only territorial income. As mentioned above, however, many of them have strong rules to prevent companies from shifting profits offshore. Developed countries truly are in a race to the bottom as national governments lower corporate tax rates in order to attract relocating companies and the economic benefits they bring. Meanwhile, multinational companies are increasing their use of tax avoidance strategies in a digital world where products and financial accounting are becoming ever more mobile. Rather than worrying about double taxation of corporate profits between countries, governments are now concerned about double nontaxation of global corporate profits. For this reason, the Organisation for Economic Co-operation and Development, or OECD, has initiated an accelerated action plan to address base erosion and profit shifting, or BEPS. The G-20 countries approved the action plan in September 2013, and the OECD has been making progress ever since on the 15 deliverables outlined in it. The last deliverable is expected to be a multilateral instrument that will enable interested countries to implement measures to more effectively counter harmful tax practices. Whatever the final outcome of the OECD process, it appears very likely that it will contain strong recommendations for member countries to pass legislation that addresses many of the tax avoidance tactics currently being used by multinationals around the world. Member countries will not be required to adopt the recommendations but could jeopardize relations with other member countries if they do not. This is especially the case for the United States, whose multinationals are huge beneficiaries of the current state of affairs. In addition, OECD member countries already have agreed to adopt a single common standard for financial institution reporting that will be the foundation for a system of automatic country-by-country exchange of this type of information. The OECD has also already released its first set of specific recommendations for a coordinated response to base erosion and profit-shifting practices. There can be no doubt that corporate inversions enable U.S. multinational companies to avoid U.S. tax, regardless of any other business reasons they may have for these corporate restructurings. Therefore, policymakers agree that the U.S. tax system as it applies to corporations needs to be updated. Given the speed with which the OECD is proceeding on its BEPS initiative, it appears likely that its recommendations will be finalized by the time Congress gets around to corporate tax reform. Nevertheless, because of the potential revenue loss to the Treasury and the rapid increase in the number of corporate inversions, it is important for policymakers to take immediate interim steps, such as those already taken by the Treasury, to slow the pace of tax-motivated corporate inversions until broader reform is possible.